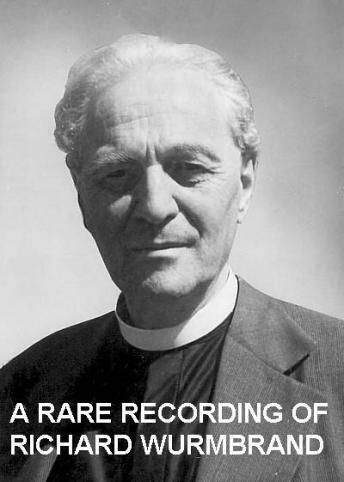 Richard Wurmbrand, born on March 24, 1909, was a Romanian Christian minister of Jewish descent. He was a youth during a time of anti-Semitic activity in Romania, but it was later, after becoming a believer in Jesus Christ as Messiah, and daring to publicly say that Communism and Christianity were not compatible, that he experienced imprisonment and torture for his beliefs. After serving five years of a second prison sentence, he was ransomed for $10,000. After spending time in Norway and England, he and his wife Sabina, who had also been imprisoned, emigrated to America and dedicated the rest of their lives to publicizing and helping Christians who are persecuted for their beliefs. He wrote more than eighteen books, translated into more than 60 languages, the most widely known being "Tortured for Christ." He founded the international organization, Voice Of The Martyrs, which aids Christians around the world who are persecuted for their faith. Wurmbrand died on February 17, 2001. Recording obtained and published by Rick Sheridan.